^ Britain’s Transport Infrastructure High Speed Two (PDF). 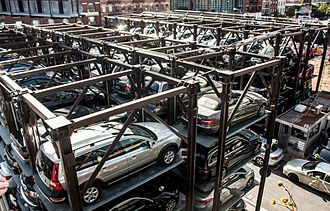 DfT. January 2009. p. 5. ISBN 978 1 906581 80 0. Archived from the original (PDF) on 2010-02-03. Retrieved 17 December 2017. ^ "HS2 could be extended to Liverpool from Manchester under plans being considered by Chris Grayling and Philip Hammond". www.yorkshirepost.co.uk. Retrieved 2019-01-06. ^ "Rail dig finds explorer Flinders' remains". 2019-01-25. Retrieved 2019-01-25. ^ "HS2 Archaeology". High Speed 2. Retrieved 2019-01-25. HS2 Phase Two (2013 Maps): High Speed Two Ltd (28 January 2013). "HS2 Phase Two initial preferred route plan and profile maps". Department for Transport. Archived from the original on 17 February 2014. Retrieved 10 May 2014. The Sheffield Supertram is an English light rail tram system in the city of Sheffield, South Yorkshire. The infrastructure is owned by the South Yorkshire Passenger Transport Executive, the service commenced in 1994 and currently consists of three lines, named after colours. It was operated by South Yorkshire Supertram Limited, an owned subsidiary company of SYPTE. In December 1997, the company was sold to Stagecoach for £1.15 million, Stagecoach gained the concession to maintain and operate the Supertram trams until 2024. Patronage has grown from 7.8 million passenger journeys in 1996/97, in 2014/15 it carried 11.5 million passengers. A tram-train extension to Rotherham is currently under construction and is scheduled to open in 2018 and this will involve trams operating on Network Rails Dearne Valley Line from Meadowhall Interchange to Rotherham station with a short extension to Rotherham Parkgate Shopping Centre. The proposed station will be a tram stop and railway station. It is planned that Rotherham Parkgate will be the hub for longer distance inter regional services, while Central station will be the hub for local, to cater for the tram train services, Rotherham Central will have a third platform built. It is thought that constructing the station will cost around £14 million, a study has concluded that it is not worth expanding Rotherham Central railway station because it would cost £161 million to expand the station but only deliver benefits worth £76 million. This is why constructing a new station is considered more viable and it is proposed a new Supertram line will be built from Meadowhall to Dore in south-west Sheffield in order to improve connections to the new Sheffield Meadowhall high-speed rail station. Construction started in 1991 and the first section to open was along a former heavy rail alignment to Meadowhall on 21 March 1994, the system consists of a mix of on-street running, reserved right-of-way and former railway alignment. The inner part of the Halfway and Herdings Park lines consist of running, with the exception of the railway station. 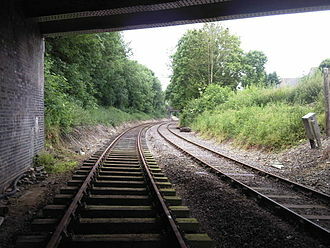 The Herdings line runs on reserved track, and the Halfway line crosses the county border into Derbyshire and this line serves Crystal Peaks Shopping Centre. 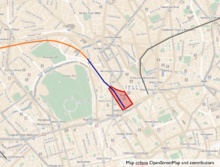 Glasgow Central is the major mainline rail terminus in Glasgow, Scotland. The station was opened by the Caledonian Railway on 1 August 1879 and is one of nineteen managed by Network Rail and it is the northern terminus of the West Coast Main Line, and for inter-city services between Glasgow and England. The other main railway station in Glasgow is Glasgow Queen Street. With over 30 million passengers in 2015-16, Glasgow Central is the twelfth-busiest railway station in Britain, according to Network Rail, over 38 million people use it annually, 80% of whom are passengers. The station is protected as a category A listed building, the station was built over the site of Grahamston village, whose central street was demolished to make way for the station platform. In 1890, a solution of widening the bridge over Argyle Street. It was intended to increase Bridge Street station to eight through lines. The Glasgow Central Railway was taken over by the Caledonian Railway in 1890, by 1900 the station was again found to be too small, passenger numbers per annum on the high-level station having increased by 5.156 million since the first extension was completed in 1890. Passenger usage per annum in 1899 was 16.841 million on the station and 6.416 million on the low-level station. The station is on two levels, the High-Level station at the level as Gordon Street, which bridges over Argyle Street. Between 1901 and 1905 the original station was rebuilt, the station was extended over the top of Argyle Street, and thirteen platforms were built. An additional eight-track bridge, the Caledonian Railway Bridge, was built over the Clyde, Bridge Street station was closed. Also during the 1901–1905 rebuild a series of sidings was created at the end of Platforms 11 and 12 on the bridge over the River Clyde and these were named West Bank Siding, Mid Bank Siding and East Bank Siding. A dock siding – No.14 Dock was created at the end of Platform 13. Central Station has a spacious concourse containing shops, catering outlets, ticket offices and it is fronted by the Central Hotel on Gordon Street, designed by Robert Rowand Anderson. The station building houses a long line of shops and bars down the Union Street side. Edinburgh Waverley railway station is the principal station serving Edinburgh, the capital city of Scotland. Waverley station is situated in a steep, narrow valley between the medieval Old Town and the 18th century New Town, Princes Street, the premier shopping street, runs close to its north side. The valley is bridged by the North Bridge, rebuilt in 1897 as an iron and steel bridge. This passes high above the central section, directly over the central booking hall. The valley to the west, formerly the site of the Nor Loch, is the parkland of Princes Street Gardens. Edinburghs Old Town, perched on a sloping ridge, was bounded on the north by a valley in which the Nor Loch had been formed. In the 1750s overcrowding led to proposals to link across this valley to allow development to the north, the noxious lake was to be narrowed into a canal of running water, with a bridge formed across the east end of the loch adjacent to the physic garden. The loch was drained as work on the bridge proceeded, the Edinburgh and Glasgow Railway opened in 1842 with its terminus at Haymarket railway station, stopping short of Princes Street. The North Bridge station was opened on 22 June 1846 by the North British Railway as the terminus for its line from Berwick-upon-Tweed. The collective name Waverley, after the Waverley Novels by Sir Walter Scott, was used for the three from around 1854 when the through Waverley route to Carlisle opened. 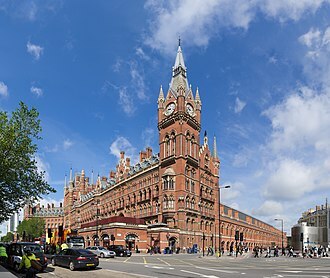 In 1868 the North British Railway acquired the stations of its rivals, the present Victorian station was built on the site, and extended in the late 19th century. Waverley has been in use since, under the auspices of the North British. From its opening in its current form by the eastward tunnelled extension from Haymarket, from 1870 to 1965 the city had a second major station, Princes Street, operated by the rival Caledonian Railway, but this was never as important as Waverley. 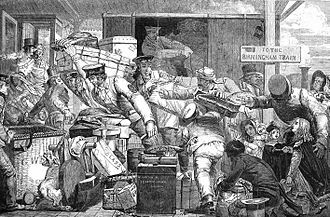 As at other railway stations of the Victorian and Edwardian eras. The North British Hotel, adjacent to the station at the corner between Princes Street and North Bridge opened in 1902, in 1983 British Rail sold it to the Forte hotel group. Nottingham Express Transit is a 32-kilometre-long tramway in Nottingham, England. 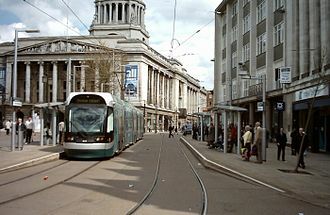 The system opened to the public on 9 March 2004 and a second phase, the tramway is operated and maintained by Nottingham Trams Ltd. on behalf of the Tramlink Nottingham consortium. 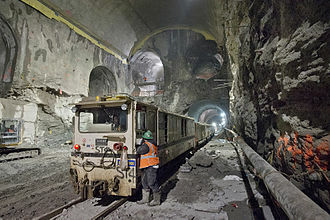 It was operated by Arrow Light Rail, another consortium, from 9 March 2004 until 16 December 2011, Arrow Light Rail had been contracted to operate the system for 30 years, the addition of lines to the system led to retendering. 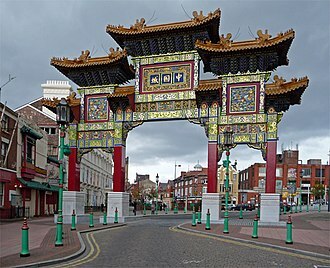 Nottingham and the urban area is the UKs seventh largest. The consortium was made up of Adtranz, who were responsible for the trams, Carillion, as built, the system was 14 kilometres long and served 23 tram stops. Construction cost a total of £200 million, a sum equivalent to £277 million at 2015 prices, once the line was complete, operation was sub-contracted by Arrow Light Rail to the Nottingham Tram Consortium, an equal partnership between Transdev and Nottingham City Transport. The line itself exceeded expectations, with 8.4 million journeys in 2004-5 and 9.7 million in 2005-6, by 2007-8, ridership had reached 10.2 million journeys. 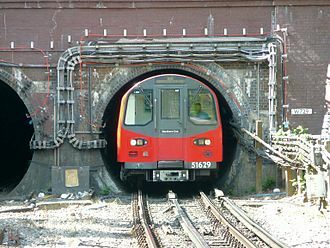 This bolstered the case for the construction of new lines, on 27 July 2009 the GMB trade union held a strike in protest at a proposed paycut of 0. 6% offered by Nottingham Tram Consortium. A maximum of five out of a normal service of 13 ran from 0600 until 1800 on the Hucknall route. Approval for phase two was given on 25 October 2006 with the UK Government agreeing to provide up to £437 million in Private Finance Initiative credits, the local councils will provide up to £141 million in PFI credits. The two local councils voted on 22 February 2007 and 3 March 2007 respectively to table an application for a Transport & Works Act Order. 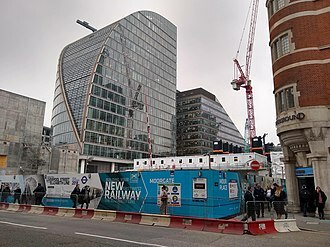 The City and County Councils’ application for the order were available to view from 26 April 2007 to 7 June 2007 when it was submitted to the Secretary of State for Transport for consideration, a public inquiry was held in December 2007. The project was given the go-ahead by the government on 30 March 2009, nottinghamshire County Council confirmed that it would not obstruct the project. In June 2016, shortly after the opening of the extension to Grand Central, a tram stands on the reversing spur in Stephenson Street. The extension to Centenary Square will continue to the right behind the tram along Pinfold Street. Moor Street station in 1915, from end of the platform, looking back towards the city centre, with the goods shed to the left. A local train waits at the terminus platforms in 1975. Part of a 1922 GWR signalling diagram. 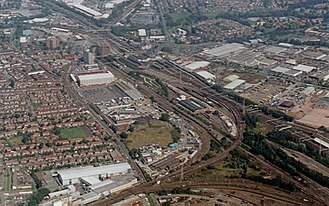 The through line from Snow Hill (to the left) is at the top, the goods station at the bottom, and the passenger platforms in the middle.